What can I say about Okamiden? 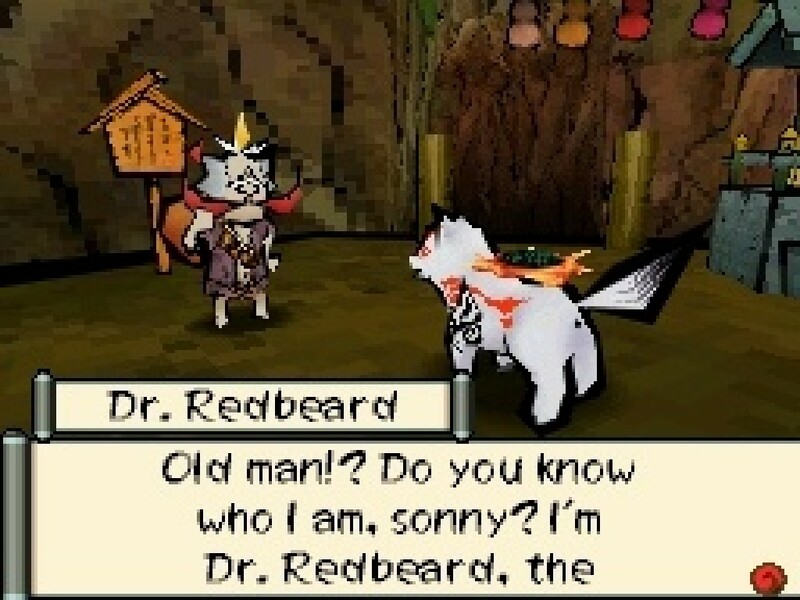 Well, it sure ain’t Okami, that’s for sure. I mean, when you have a sequel to something, you can expect to say, “it was the same, yet different”. But Okami was a huge cult classic. There were fan expectations to meet. 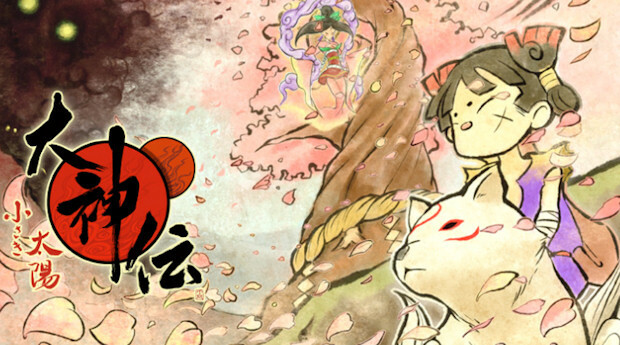 Okamiden could never be its own game, it’ll always be the sequel to Okami. And when I heard about what was in store, I was intrigued. Playing Amaterasu’s kid makes sense for a sequel. You could be this just-as-epic-but-slightly-smaller version of Ammy. There was so much potential. 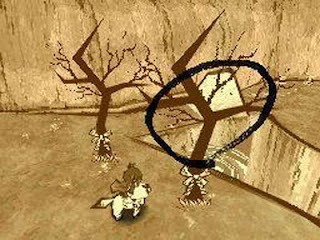 Instead, you play as a little chibi wolf… seriously they even call you Chibiterasu. It’s not like it doesn’t work at all. The game’s still going with the Japanese theme. It’s just not traditional Japan now. It’s cutsie stuff. And I’m sure some people loved it. But it was enough to make me put down the game for a while. Once I picked it back up, I wasn’t completely disappointed though. This game would never live up to my obscene expectations. I realise this now. 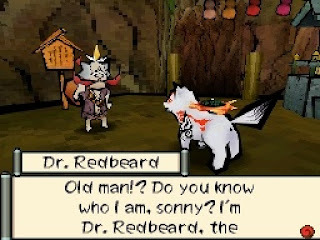 Part of what made Okami great was its originality, so of course I don’t know what I could have been expecting. So, other than the fact that you can never duplicate the awesomeness that was Okami, especially with Clover Studio gone and chibis running around everywhere, how good is Okamiden? It’s pretty cool. They brought back a lot of the right stuff, and changed things in interesting new ways. Like, the world is pretty much the same layout as before, but now there are new places, and certain characters have had kids, which is really fun to see. Maybe some people won’t like that it’s much of the same world, especially since there can be some backtracking, and you start to wonder how many times you’re going to see certain parts of Nippon. Then again, some might like that. We’re brought back to that beautiful world that we love, with slight changes. For example the beautiful Yakushi Village. Certainly, the world has the same beauty as last time, whether you’re in the new or old parts. Of course they brought back the Celestial Brush and the whole painting objects into existence thing. If that weren’t back, I couldn’t have done the review, because I would have thrown the game out the window then demanded my money back. And it works just as well as the Celestial Brush did in the PS2 version of Okami, and way better than the Wii version, which gave me enough trouble that I stopped playing the game on the Wii. I sometimes found the simple act of running to be tough. You’re playing as a puppy and I feel like maybe they made the controls just a little bit difficult on purpose, which is cute but also hellish. I learned to walk properly twenty-something years ago, and I really prefer it to derping around. The fight mechanics are also a little clunky. It can be hard to point your character in the right direction, for example. And this isn’t really the game’s fault, but my right button is starting to crap out, so using the Celestial Brush can be tough, which can makes the battles slow and sometimes make me lose a good hit or combo. The characters and story were pretty fun, though. There’s still a lot of charm, like there was in the first one. A little less of the tranquil beauty brought on by playing a wolf with a long, flowing gait, but lots of people who aren’t me like cutsie stuff. It’s forgivable in most cases. The Nintendo DS is really the perfect fit for the game, too. No, you can’t see glorious Nippon on your giant flatscreen this time, but since it’s already a chibi version of everything else Okami was, why not make the screen and console smaller, too? The only real flaw with the DS is, like I said, that buttons tend to stop working, and one of the main parts of the game, the Celestial Brush, uses them. Can’t blame the game for that, though. So all in all, Okamiden isn’t Okami. I played Okami every single day until it was done. It took me months to get through Okamiden. This is not the same cult classic. But it’s not a bad game. A little rough around the edges, maybe. But not bad. Not bad at all. Choosing Handhelds Over Next-Gen Home Consoles?